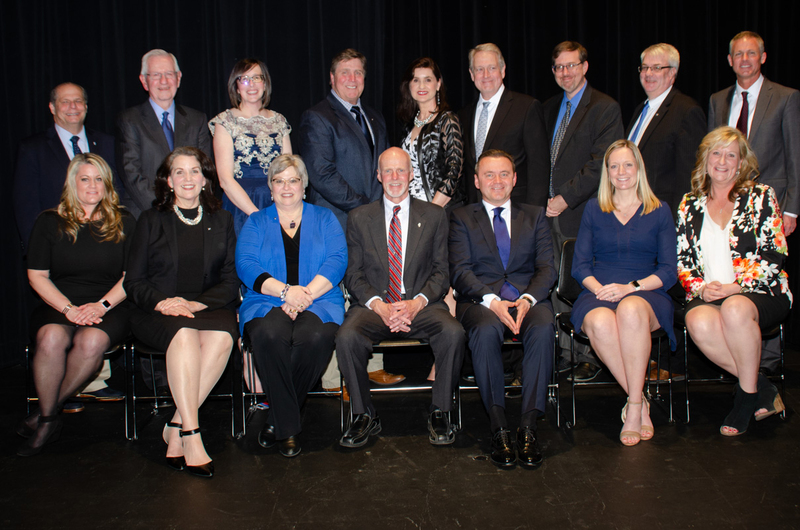 On Friday, April 12, 2019, the Graduate School and the Graduate Alumni Advisory Board welcomed back ten graduate alumni celebrating their induction to the 2019 Class of Outstanding Graduate Alumni. Alumni were nominated by graduate programs and were selected by the Graduate Alumni Advisory Board. The 2019 Class of Outstanding Graduate Alumni along with EIU administrators pictured above: Honored alumni in the front row: Lyza Shaw, '98, '99, (nutrition and dietetics); Patty Poulter, '82, '83 (music); Jacqueline Joines, '88,'96 (technology); Jim Acklin, '79, '87, '98 (educational leadership); Sebastian Huluban, '03 (political science); Charity Bohnhoff, '08 (mba); Lynn Holdheide, '06 (special education) Back row: President David Glassman; Tim Burke, '71, '72 (college student affairs); Amanda McKay Williamson, '01, '02 (English); Dan Stephenson, '77, '79 (biological sciences); Dean Jeanne Lord, College of Health and Human Services; Dean Bill Minnis , Lumpkin College of Business and Technology; Associate Dean Chris Mitchell, College of Liberal Arts and Sciences; Dean Doug Bower, College of Education; Dean Ryan Hendrickson, Graduate School. To view biographies of this year's honorees as well as those of the past, see the links below. If you would like to submit your name for consideration for this award or would like to reconnect with other graduate alumni, please e-mail graduate@eiu.edu or visit our Facebook page. The mission of the Graduate Alumni Advisory Board is to promote superior graduate study through philanthropic and alumni programs that advance the mission of graduate education at Eastern Illinois University. The vision of the Graduate School Alumni Advisory Board is to offer superior graduate alumni programs that achieve the Board’s philanthropy goals resulting in awards that attract the finest graduate scholars to Eastern Illinois University.